I took this photo the other day with my Canon 30-D dSLR. It was late in the afternoon in Bald Mountain State Park. There’s not a lot of activity in the park this time of year, and the roads and trails, lakes and picnic tables are little used. It was really too early in the year to see any fall color and not late enough in the day to take advantage of the waning sun for the decent, warm light photographers want for their photographs … except here. 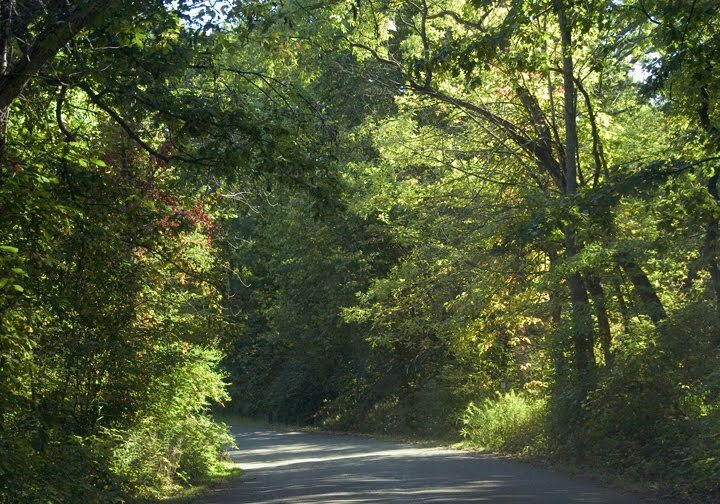 The narrow road seemed almost enveloped by the park’s underbrush and trees, and the late afternoon sun made it seem like this stretch was a long, dark tunnel coming out into the light. I could not help being reminded of those last three lines of Frost’s famous poem, one of my favorites. It often amazes me where life has led to this point. The journey’s certainly not been what I envisioned for myself at sixteen. But, as I look back on it, it hasn’t been bad, either. It’s actually been pretty good, and it’s just … well, it just is. And I can hardly wait to see what’s on the road tomorrow. This entry was posted on September 20, 2009 at 8:45 pm and is filed under Non-Fiction Writing, Storytelling. You can follow any responses to this entry through the RSS 2.0 feed. You can leave a response, or trackback from your own site. Yes, there's always hope along the trail of life. God made a beautiful world for us to enjoy. Nice shot.